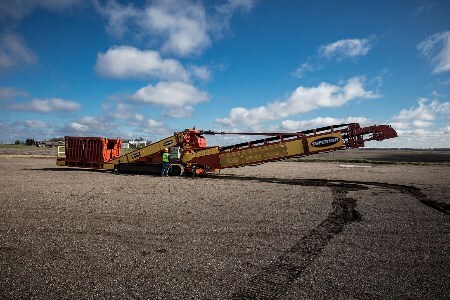 Superior Industries Inc., a US-based manufacturer and global supplier of bulk material processing and handling systems, has completed manufacturing of its first Razerlink™ mobile conveyor: a multi-functional machine designed to load, unload, transfer and/or stockpile material. According to Superior engineers, by combining mobility with telescoping conveyor technology the Razerlink mobile conveyor limits downtime and accelerates material handling. Additionally, one time handling of material aids in maintaining high-quality material spec. Each unit is tailor-made to the exact conditions of the customer’s operation, whether it be a barge, rail, quarry, mining or construction site application. Mobility options include conveyor tracks, drive tires, or towable tires. For applications not requiring telescoping capabilities, the Razerlink mobile conveyor can be fitted with a fixed length, radial, or luffing conveyor. The unit’s feed design can come in the form of a drive over ramp, back up ramp, or feed hopper, which accommodates most loading styles. The units are built in 48 in. (1219 mm) or 72 in. (1828 mm) wide models and can transfer material at rates up to 1500 tph.